Cyclists should follow the lead of successful bicycle mechanics by properly maintaining their bikes before and after each ride to prevent major problems from occurring. "Small, easily addressed issues can develop into dangerous and expensive failures if left unattended," says Daimeon Shanks, a former elite-level racer and mechanic for Garmin-Transitions ProTour cycling team and the U.S. national cycling team. "In about the time it takes to down a postride espresso at your local coffee shop, you can give your bike the same attention that the pros bikes receive after each race." 1. Check the wheels. Make sure the quick-release skewers are tightened correctly. Spin the wheels to check that they are true and don't rub on the brake pads or anywhere on the frame or fork. "If there is a wobble in the rim, go ahead and true it before the ride," Shanks says. He also advises checking that the wheels turn freely and there are no grinding noises coming from the hub. "If the wheel stops turning after only a few revolutions or if there is a grinding sound from the wheel, then you'll need to adjust the hubs," Shanks adds. Shanks explains. Replace the tire if it is severely worn or has cuts." 3. Test the brakes. Spin the wheels and apply the front and rear brakes independently of each other. Check that the brakes engage before the brake lever reaches the handlebars and that there is enough stopping power to be safe. "It is also important to ensure the brake pads are not worn," Shanks says. Inspect where the brake pads hit the rim; they should contact the rim evenly on both sides and not rub the tire in any way because this will cause a flat." 4. Lube the chain. "There are many styles of lube available, and each works differently in different conditions," Shanks says. "If you're unsure what to use or if you like to keep only one type around for all conditions, then use a light oil, such as Tri-Flow." Apply a small amount to the inside of the chain as you pedal backward so the entire chain gets an even coat. "It's important to note that you should always apply lube to the inside of the chain so that, as you pedal, centrifugal force will push the lube into the chain parts," Shanks explains. "If you apply the lube to the top of the chain, the centrifugal force will simply fling the lube off the chain before it does any good." 5. Check the shifting. Check that the rear derailleur shifts evenly and smoothly between all the gears on the cassette. "Also check that the chain doesn't fall off the front chainrings when performing front derailleur shifts and that it shifts smoothly between the small and large chainrings," Shanks adds. "A quick run-through of your bike's most important working parts is all that's necessary," Shanks says. "With proper maintenance, your bike should last as long as you care to take care of it." Essential Bicycle Maintenance & Repair takes a straightforward approach to cycling's most common repairs. Information on choosing the best frame, selecting tires, and discerning types of brakes is presented along with instructions on installing caliper, cantilever, and V-brakes. Readers also have access to a quick reference that lists the most common problems, including troubleshooting shifting and derailleurs, and suggests the appropriate repairs. For more information on Essential Bicycle Maintenance & Repair or any other sports resource, contact Human Kinetics at 800-747-4457 or visit www.HumanKinetics.com. 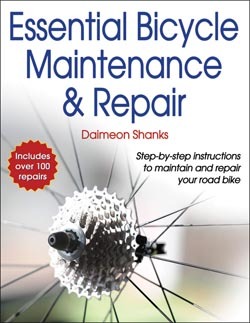 "In Essential Bicycle Maintenance & Repair, Daimeon Shanks takes a straightforward approach to repair and creates the go-to resource for cyclists." "Daimeon Shanks belongs to an elite stratum of bicycle mechanics. Seasoned by the triage nature of top professional cycling on the road, trail, and track, Shanks' experience and ability to eloquently advise show through in Essential Bicycle Maintenance & Repair." Daimeon Shanks has two decades of experience in cycling and has worked as a professional mechanic in every discipline of the sport, including mountain, track, road, and cyclocross. His work experience includes stints with the Mavic Neutral Support Program, as the head track mechanic for the U.S. national team, and as the resident mechanic at the U.S. Olympic Training Center in Colorado Springs. He also spent five years as a mechanic with the Garmin Transitions ProTour cycling team, working events such as the Grand Tours of Europe, the pinnacle of road cycling's hierarchy.